Well, that was fast. The Cash for Clunkers program is already out of money. They blew through that billion pretty fast for an ailing economy, eh? I just heard a radio commercial made by Milwaukee icon Ernie Von Schledorn, where he says something like, The government is going to give you money for your clunker. Ah, how easily we are entranced by the prospect of getting "free" money from the government as if it has no cost. I wonder how much we would embrace the program if all commercials advertising Cash for Clunkers would have to say, You taxpayers are giving these buyers $3,500 to $4,500 to turn in their old heap and buy a new car. The government allotted $1 billion for the original Cash for Clunkers. In very rounded numbers, if we divide that number by number of taxpaying returns -- about 100 million -- we get roughly $10 per average taxpayer. According to CBS News, the House just passed adding an additional $2 billion into the program! The Senate is to take up the measure next week. That additional $2 billion would generate another $20 tax liability for those of us who actually pay taxes. One way to know if a program is really a good idea is to ask yourself, would I give a total stranger $30 in order to help them buy a new car? (I am a taxpaying household.) Would you even give them $10? I wouldn't. I suspect you wouldn't either. Another thought: Considering that all these clunker chuckers now have to buy a new car, is our economy sluggish because people don't have the money to spend or because they don't have enough faith in our economy to part with their money? Obviously, getting up to $4,500 in "free" money has nudged these reluctant consumers into the buy column. We don't know the long term consequences of this program. I have to think it will take a fair amount of affordable cars off the market, the cars that lower income families and college students depend on for their transportation needs. On the positive side, the automotive industry is at last making some sales. Although I am not in favor of deficit spending to stimulate the economy, is anyone wondering what a plain old stimulus check paid directly to taxpaying Americans would have done to stimulate the economy instead of the $787 billion dollar pork laden one we were saddled with? More reading: Aug. 4, Obama administration withholds data on clunkers: 6 out of 10 vehicles purchased are Honda, Toyota and Hyundais. Are you particular about which doctor or dentist you see? I am. I believe in a Holistic, natural approach to medicine. A doctor needs to treat the whole person, not just prescribe medication for an isolated symptom. The goal is health, not just making an unpleasant symptom go away. Some people don't care; any M.D. or D.D.S. will do. But I will pay a higher deductible, co-pay, and/or coinsurance fees just so I can be treated by who I want to see. I pay extra, because it is very important to me. Fortunately my insurance plan allows me to choose. So when President Obama promises over and over again, "You'll be able to keep your health care plan, period," and "...you like your doctors, you like your plan, you can keep your doctor, you can keep your plan. Nobody is talking about taking that away from you." Yet he was forced to clarify his promise, "It seems he wasn’t saying 'no one' will take away any American’s health insurance – he was saying the government wouldn’t. Which is not to say that the government wouldn’t create a situation where such a thing would happen." He also admitted that he hadn't actually read the House bill, which spelled out that in effect, we would lose our doctor and health care plans under his reforms. Since Obamacare is really just an expansion of Medicaid/Medicare-like plans, I asked my doctor if she took Medicaid/Medicare patients. She said no, unless they paid her directly. Reason? Medicaid/Medicare insurance requires too much paper work and often doesn't pay enough to cover the services. My doctor is not alone; same is true of my holistic dentist, my former chiropractor, and another holistic doctor I know of. Patients can pay out of pocket, of course, but their government insurance plan is not accepted. My doctor did say she would discount her fees by 25% if the patient paid cash. Other doctors may make similar arrangements. So how can the President promise that we can keep our doctors under his plan? The language of the House bill states that any change in your current private plan will bump you into the government plan. Since private plans are likely to change somewhat every year, we won't be able to keep them for long. "If you get your health insurance from a large employer, you will not be able to keep your current health insurance. After 5 years, large employers will be required to offer only government approved plans. Government approved plans will not offer treatments that the government refuses to approve because they cost too much relative to the government's determination of value. "If you buy your own health insurance from a private insurer, you will lose your insurance if either you or your insurer changes your plan. Need a higher or lower deductible or to add or subtract a family member? Too bad. After the law passes, private insurers will not be allowed to issue any new individual plans. There are lots of rumblings heard about compromise these days. Obama wants his reform passed. But even if the above stipulations are removed, the fact that employers can get out of providing their more expensive plans by paying a fine instead, will in effect lead to the demise of the private insurance industry. If the mandatory insurance coverage language is removed from the bill, creating a larger government program still creates unfair competition for private insurance companies. Medicare/Medicaid insurance dictates certain 20%-30% discounts to doctors and hospitals. How is that fair competition? So much for keeping your doctor and plan. Now, will doctors like mine be forced into accepting Medicare/Medicaid patients once everyone is on those plans? Who knows. What I do know is that my doctors provide very good care and their standard is quality, not quantity. They do not have the meat-market approach to medicine. They will not be able to continue their current level of service under Obamacare. The health care industry does need improving, but we need MORE choice not less in the type of insurance offered and doctor you see. Past post: The Wizard of Obamacare: Pay NO attention to the man behind the curtain! No, this post isn't a commentary on Obama's $timulus bill that we just found out included $20.5 million dollars worth of pork and ham purchases. Instead, I am talking about the REAL Spam capitol of the world, Austin, Minnesota: home of Hormel's SPAM MUSEUM. Yes, there really is a SPAM MUSEUM! Although it is not a destination in itself, it certainly is a fun drive-by attraction. Located just off I-90, it is easy to find and well worth the hour or two visit. We happened upon it several years ago* on a road trip to Yellowstone National Park. 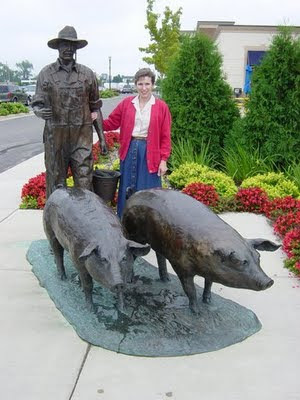 There it was in all it's glory, complete with bronze statue of a farmer and 2 pigs. Attractions include a computer Q & A Cafe of Spam facts. They cleverly placed the computer controls on breakfast plates of Spam and eggs! Just roll the egg yolk track ball and click the butter pat to select the answer. The facts appear on the specials of the day menu. There is a Monty Python section, with wacky clips from the show--evidently Spam was a popular topic of the program. On the more serious side, there is a Spam movie and interactive things for kids to do too. The gift shop was pricey, in my opinion, but we each did buy a Spam can bank. (They also sell SPAM!) At least the museum admission was free, as I recall, which is more than I can say about touring Kelloggs' Cereal City in Michigan. 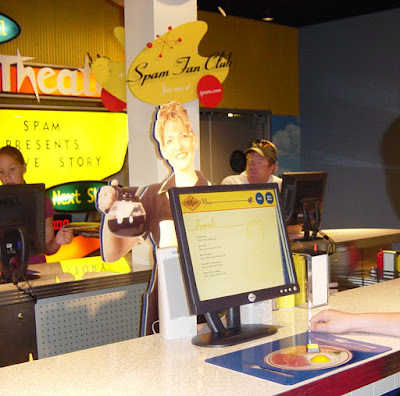 So if you are heading out on I-90 sometime, make plans to stop at the Spam Museum in Austin, Minnesota, and serve up some fun. I think you will find it an entertaining diversion. Do call first to make confirm their hours: 507-437-5100. 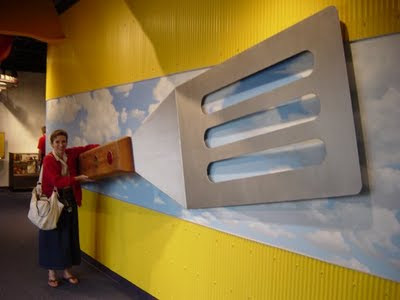 *Third time was a charm for us with the Spam Museum: We first came upon it while looking for a place to eat in Sept. of 2001. Since we like to visit interesting places we serendipitously discover on our trips, we decided to stop in the next morning. The next day we found out it was brand new but closed--its Grand Opening scheduled a few days before on Sept. 12th was delayed because of the 9/11 attacks. Oh well, next time? The next trip out in 2004 we again planned on visiting. That time the museum was closed due to flooding! At last we made it in 2006. The Wizard of Obamacare: Pay NO attention to the man behind the curtain! In the story, The Wizard of Oz, there comes a time when Dorothy and the troubled trio return to the Great Oz, "a disembodied and imposing head with a booming voice," to reap their promised rewards. While talking to the Great Oz, Toto pulls back the control room curtain to reveal an old man, a mere mortal, at the controls of the projection booth. Dorothy realizes that the Great OZ is nothing more than an artificial projected image created to impress the residents of the Emerald City. That is when Oz says that famous line, "Pay no attention to the man behind the curtain." That is the fanciful story called The Wizard of Oz. The man behind the curtain is the reality; the projected imposing head isn't. America's fantasy story is that the government can provide health care for everyone, including 12 million illegal aliens, and do it better than the private insurance industry can. * Oh, did I mention it wasn't supposed to bankrupt us? The Emerald City had Oz; he made promises he couldn't keep. We have our our own wizard, The Wizard of Obmamacare, a.k.a. President Obama. Our Wizard is promoting and promising health care reform miracles. There was no real Oz in the story. He was just an image controlled by a mere mortal, bound by the constraints of the real world. There isn't any reality to The Wizard of Obamacare either. He may promise anything he wants, but his promises are still bound by the constraints of the health care bill H.R. 3200 as it is written. The bill is the man behind the curtain. When asked a specific question regarding the outlawing of private insurance in section 102 of the bill, President Obama admitted, "You know, I have to say that I am not familiar with the provision you are talking about." He had not read all of the bill--not even that very imortant section. Of course, our President has a tendency to say anything. Remember he also said that health care reform would reduce costs. He also promised not to implement health care reform if it would result in higher deficits. I am encouraged that some Representatives are balking at rushing into approving this devastating bill. I am concerned when I start hearing about compromise measures added to get the thing passed. Legislation of this magnitude needs to be carefully considered, not blindly approved. It needs to be scrapped, not amended. In case you didn't realize, Toto in my Wizard of Obamacare story is anyone taking the time to read and find out what HR 3200 actually says. Totos would include the legislators who take time to read the actual bill, talk radio hosts and conservative bloggers who delve into the details, and now even some media is pulling back the curtain. Dorothy could be the American public and Congress who are losing confidence in the Wizard of Obamacare and the Wizard of Obamaeconomics. I hope the Dorothys wake up before it is too late. *Does health care need reform? YES. But it is not an all or nothing proposition needing to be approved by Aug. 8th or anytime soon! More reading: Does the House Plan Outlaw Private Insurance? Obamacare: You Will Lose Your Current Insurance. Period. End of Story. I almost can't believe it; the Siepmann House is saved! After years of disappointing decisions regarding development in our city, I almost can't believe that the Common Council voted unanimously, 13-0* to allow the Siepmann Farmstead to stay last night. They did it with no discussion. In so many past cases, the will of the people has been ignored. Capitol Heights comes to mind. That one was B.B., before I started blogging. Then there was TID 3. Many spoke out against that one at a plan commission meeting. It passed anyway. How about the heartbreak of widening Calhoun Road south? Maybe those examples are what make saving the Siepmann such a pleasant surprise. The only hurdle remaining is an economic one. Will the developer 4S be able to make the changes he has proposed in this economy? I certainly hope so. As I stated before, the concept of a wedding center seems to be a good fit for the property. I am grateful for the person who first put together that the demolition of the barn, noted in the first article, was really the farmhouse and for the Elmbrook Historical Society member who brought the issue to Cindy's and my attention. You know, as a blogger, I often wonder if what I am posting will help or hinder an effort. In this case, I am delighted it turned out positively. *Alderman Bob Reddin was not present. He was attending to a more important development, the birth of his new daughter! How much to raze Siepman Home? Nearly every morning when I first wake, my first thought is, thank you, God, for a safe, peaceful night. When you consider all the people in our world, country, state, and even metro area who cannot say that, it is humbling. I am truly blessed. My old neighborhood in Riverwest, where my husband and I lived in our younger days, has been in the news lately. First there was a shooting at a street festival about 200 feet from our Weil Street home. (Select street view and rotate Google maps to check out area.) That distance was significant to me because it is the same frontage of my present home in Brookfield. The close proximity made the shooting all the more sobering. Two UWM students have been murdered in my old neigborhood within the past 2 weeks, yet the article said the residents of the area still felt safe. All I know is that I am glad we no longer live there. While we did not constantly worry about our safety, I think that was more a case of ignorance being bliss. There was, however, a pretty steady stream of annoyances. On weekends, we could count on loud, live music from the bar across the street until 2-3am and loud drunks outside our window talking, shouting, doing drugs, etc. after 2-3am, when the bars closed. There were stolen car batteries, a bashed in car door on our restored 65 Mustang, and all the windows, save the windshield and passenger door, on our station wagon shot out by a BB gun. (We called that the St. Valentine's Day massecre because they did it on Valentine's Day.) And who could forget the plum fight in our alley that used our trees' fruit as amo. What a waste and mess. Both neighborhoods have their share of robberies, that was one unpleasant surprise of life in suburbia. But by in large, we feel safe on our streets, even at night here. We have lived here in Brookfield since 1986 and treasure our neighbors and neighborhood. It is indeed a privilege to live in relative peace and quiet, it's one of the blessings I count every day. How about you? "President Obama will announce Monday that he plans to cut the nation’s projected annual deficit in half by the end of his first term, a senior administration official said Saturday." ..."Under White House projections, this year’s inherited budget deficit of $1.3 trillion will be cut to $533 billion by fiscal year 2013, the end of the first term. 'So we’ll cut it at least in half,' the official said." Well, since that time, we have not cut or saved much of anything. In fact, our deficit just hit $1 trillion and is projected to reach "$1.84 trillion, four times the size of last year's deficit of $455 billion" by budget year end. Some predict $2 trillion. Today we learn that the White House is delaying the usual mid July budget update until mid August. Why would that be? They say it is because it is a transition year between administrations and the president only just released his his full budget in early May instead of early February. Maybe. If so, shouldn't the vote on Health Care reform and Cap and Trade be delayed until it is released? President Obama promised just last week that, "health insurance reform cannot add to our deficit over the next decade and I mean it." Obama also said that his health care reform will save money, but the Congressional Budget Office (CBO) doesn't agree. Douglas Elmendorf, the head of the CBO warned it would "significantly expand" federal costs. "The main health care proposals Congress is considering would not reduce costs - as Obama has insisted - but 'significantly expand' the federal financial responsibility for health care." The CBO office just reported that, "Under current law, the federal budget is on an unsustainable path—meaning that federal debt will continue to grow much faster than the economy over the long run. Although great uncertainty surrounds longterm fiscal projections, rising costs for health care and the aging of the U.S. population will cause federal spending to increase rapidly under any plausible scenario for current law." I am all for cutting the deficit in half by 2012, but just saying so doesn't make it so! Outside of national defense or other real necessities, we cannot afford to do anything new that adds to our deficit. But our president still wants his Health Care bill to be passed in early August before Congress recesses for the summer and BEFORE the Budget Update is released. Is that being "honest in its accounting?" More reading: Obama's Health Plan Needs Spending Controls, CBO Says: "President Obama's plan to expand health coverage to the uninsured is likely to dig the nation deeper into debt unless policymakers adopt politically painful controls on spending, such as sharp reductions in payments to doctors, hospitals and other providers, congressional budget analysts said yesterday." TANSTAAFL, Mr. Congressman; TANSTAAFL, Mr. Obama! One of the first lessons we learned while studying Economics in our home school was "Tanstaafl, the Romans and Us." It was chapter 2 in Richard Maybury's book, Whatever Happened to Penny Candy? The book is simply written but contains invaluable information on the principles of economics and how the world works. Too bad it isn't required reading for every President, Legislator, Judge, Cabinet Member and Czar. So, what is TANSTAAFL? Tanstaafl stands for: "There Ain't No Such Thing As A Free Lunch." It was a very popular saying during the Great Depression. Tanstaafl is a law of economics--a fact of life--yet our government and president in particular seem to have never learned about it. It says that everything of value carries a cost or put another way, nothing of value is free. "Someone must pay for it, if not with money, then with time and hard work." Chapter 2 opens by discussing the double-digit inflation of the 1970s and early 1980s--the Carter years, something our nation had not really experienced before. (Exception being the Confederate dollar during the Civil War era.) Maybury then compares what went on in ancient Rome with our economic woes. Imagine if this book was written today? The US Deficit just hit $1 TRILLION dollars, a new all time high, and could reach $1.8 or so Trillion by year's end. Ancient Rome was famous for its road system and wars to conquer other nations. Both of those things require money. Lots of money. Public works projects and a large standing army require funding. How do you do that? Well, to pay taxes, you have to have some sort of job. Hence, another thing we have in common with the Roman Empire; they had a large welfare program. So Rome had public works projects, a large standing army, and welfare to fund, but very little actual manufacturing or productivity in their country. You can only tax so much--even if you are Rome! The Emperors knew that too high a tax rate might result in revolt, not polite Tea Parties, but actual revolt. Today, we would just inflate the money supply by printing more money. They used silver coins so they solved the problem by clipping off the edge of each coin collected in taxes and then melting the clipped parts to mint more coins. Of course the money was not worth a full Denarius anymore, but the Roman government did it anyway. They wanted to fund their wish list of public works, army, and welfare programs to keep the unemployed masses happy. They hoped nobody would notice. But the merchants did notice. After a few close shaves, the coins were noticeably smaller and lighter. Merchants started to refuse clipped money or required 2 clipped coins for one real one. The currency was DEBASED. DEBASING currencies and INFLATION go hand in hand. Not just in Rome but in the USA. At its extreme, this is what happened in pre WW2 Germany, where a wheelbarrow of German Marks was needed to purchase a loaf of bread. Today, Europe and China are concerned about how much we have inflated our money supply. Our Secretary of the Treasury was laughed at in China when he told them the dollar was secure. Savvy Americans are concerned too. That is why you hear so much talk of investing in gold. The only ones that don't really believe in TANSTAAFL are the politicians proposing one costly measure after another without the ability to pay for it: TARP under President Bush, and now President Obama's BAIL-OUTS, STIMULUS 1, CAP and TRADE, NATIONAL HEALTH CARE, and now talk of STIMULUS 2. Keep TANSTAAFL in mind. It applies to all aspects of life. Everything has a cost, whether it is money, time, effort, loss of quality of life. Nothing is free; someone always pays for it. Just like the laws of Physics that state you cannot create energy out of nothing, you cannot create money out of nothing either, not even to fund unprecedented government spending. It's because TANSTAAFL. If you have not called your Senators, do so. (I heard that Kohl was showing signs of weakening on Cap and Trade on Marl Levin last night?) A polite call is the most effective and I make sure they take my name. I urged them both to oppose Cap and Trade, Health Care Reform and threw in opposing Sotomayor too. Vice President Biden should read it too: "We Have to Go Spend Money to Keep From Going Bankrupt"
If you have been following the save the Siepmann Farm House issue at Brookfield's Stonewood Village, you know that back in May, it looked like it would join the scrap heap of Brookfield's historic buildings. In my May 18th post, Stonewood Village's Siepmann farm on chopping block at Tuesday's Common Council meeting, I asked, "...can't we find some way to save the Siepmann farmstead and still do the wedding center?" and then urged that readers contact their aldermen. The Siepmann Farm Homestead is a good example of a reader suggested blog topic. The morning of May 18th, someone sent me an email regarding moving or razing the Siepmann home. Since I thought it a worthy topic and blogged about it. Shortly after that, I took some pictures of Stonewood Village and the house in question and blogged about it again on May 21st : How much to raze Siepmann Home? asking the question is it cheaper for the developer to give the building and $10,000 or raze it? That post prompted a lot of comments--some not too complimentary to me. I commented, "...When I was there, it seemed there would be room for the connector road to be built in front of the home? Possibly that could be the solution to saving the home (in place) and still connecting the parking lots? If that frontage road is a violation of set backs, maybe this is where the Common Council could grant a variance?" "...The owner can do what he wants with his property. I think the best way to save the farmhouse is by convincing the owner that the house is what makes Stonewood Village unique, not just another strip mall. If the house qualifies for historic registry, the owner could probably get some tax breaks too. The Council vote will give Brookfield residents a little time to speak up about historic preservation. I plan to contact the mayor and my alderman and insist that they approve a plan that doesn't include tearing down an important piece of our history. Maybe a variance, as Kyle suggests, is in order here. Once this farmhouse is torn down, it's lost forever. Let's speak up before it's too late." I contacted my alderwomen on May 21st, asking if there could be a compromise. My alderwoman Lisa Mellone made some phone calls and further nudged the Siepmann into the saving direction rather than the razing. Along with a combination of publicity, the Elmbrook Historical Society, and city staff, Dan Ertl I am told in particular, and of course, developer 4S worked together to get us to this point. Brookfieldnow also made it the topic of a comment poll. Saving the Siepmann, by allowing a variance for the connector road to run in front of the home, just won unanimous approval by the Brookfield Board of Appeals on July 10th. Yesterday, July 13th, Brookfield's Plan Commission recommended approval of the new frontage road placement by a vote of 5-2. Brookfield's Common Council will vote on the new design on July 21st at City Hall. The meeting starts at 7:45pm. I know some Stonewood Village neighbors are concerned that saving the Siepmann will lead to increased density at the Wedding Center. I don't blame them. They are still licking their wounds over Capitol Heights. So far, increased density is not an issue with developer 4S. Ultimately, I hope the council will approve the new design and keep the Siepmann home in place. Again, I urge you to contact your alderman regarding the Siepmann decision. When I was in 2nd grade, our librarian, Miss Pills--yes, that really was her name--would read to us every week. She introduced us to the adventures of Elmer Elevator in a series of books written by Ruth Stiles Gannett: My Father's Dragon, Elmer and the Dragon, and The Dragons of Blueland. Elmer is an appealing character for children. He's an inventive boy who in the 1st book, McGivers his way across a dangerous, crocodile infested river to rescue a baby dragon. Cleverly, he rubber bands lolly pops to each of the gators' tails. They become so interested in licking their neighbor's sucker, they form a stepping stone like crocodile bridge across the water. Elmer then walks across their backs and rescues the dragon. More than anything, we enjoyed hearing about Elmer's friendship with Boris, the young dragon, who would allow Elmer to ride on his back when he flew. In the 2nd book, we soon found out that dragons love to eat SKUNK CABBAGES! "...Elmer threw down the [skunk] cabbages one by one, and the dragon caught each cabbage in the air, laughing and crying at the same time because he was so happy and hungry and thirsty." 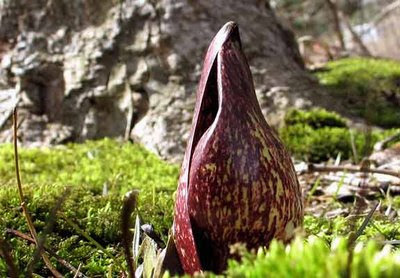 Now, as a child, I thought a skunk cabbage was just a fanciful vegetable crafted in the author's imagination. It really wasn't until I moved to Brookfield and ventured into our neighborhood's Kinsey Park creek streambank area that I discovered they were indeed a real plant. The plants grow along streambanks. Kinsey Park used to have a much larger skunk cabbage population until the DNR's streambank restoration project bulldozed the area in 2003. Fortunately, a few survived and are making a slow comeback. I also spotted some along the Calhoun Road creek, just north of North Avenue. I would think they could be found in most Brookfield wetlands. This time of year, the 1 - 2 foot tall plants are pretty easy to identify. I read the books with my son when he was young, and he enjoyed them as much as I did. They are each under 80 pages long with lots of illustrations and are easy to read. The Brookfield Library has all 3 in their collection. Maybe your children would enjoy reading the books with you this summer? Then you can go in search of skunk cabbages, but be on the lookout for dragons! Ahoy Kids, there be Buried Treasure in Brookfield! For children going into K4 through 6th grades this fall, there be Buried Treasure to be found in Brookfield. Actually, Buried Treasure is the theme of this summer's Vacation Bible School at Brookside Baptist Church next week, July 13 - 17th, 6:25 - 8:30pm. There will be skits, games, refreshments, missionary stories, Bible verses and Bible lessons. The kids have a blast. Take a look at some of the things they did last year. Your kids can bring their friends--they are all welcome. These 2 ruffians were registering children last week at church, but you can avoid rubbing elbows with their kind by registering online or by calling the church: 262-783-6180. Special activities: Wednesday night is Moms Night, moms can enjoy fellowship time with the ladies, Friday night is Family Night, bring the whole family for a special assembly, service and carnival. Ban smoking in military? Does that include Commander in Chief? Today's government overreaching news item is: Pentagon May Try to Ban Smoking in Military. Now, I hate smoking. It is probably one of the most detrimental to health and wallet lawful habits a person could ever participate in, plus it stinks. But it is legal. Ironically, our governemnt seems to delight in taxing tobacco to help fill their coffers while banning its use in more and more situations. Guess who turned 50 this year? How about a party? This week, Barbie collectors and fans are meeting in Washington DC for the National Barbie Doll Collectors Convention's Fiftieth Anniversary Gala party. A friend of mine is there right now celebrating everything Barbie. It sounded like fun. That got me to thinking...if you have daughters and are looking for something fun to do this summer, why not hold your own Barbie 50th Birthday party? Invite a few friends over for lunch and don't forget to invite the Barbies too. If it is barbecue / picnic fare, then guests and Barbies dress for that. If your gathering is more like high tea, then the girls and Barbies could don their best. Maybe they could try to dress alike? Moms could come too--maybe some still have their Barbies--then you could do Barbie Through the Decades. Barbie is somewhat controversial in some circles, but I really enjoyed mine. I still remember the excitement on the day my sister and I went to the downtown Boston Store to purchase our dolls. The price was $3.00! The outfits in the little catalog/magazine ran $1.00 to $6.00. Most were in the $2.00 - $3.50 range. They were beautifully made. My sister and I would play Barbies together and with our friends from about 4th grade through Jr. High. Mattel didn't have the Barbie Dream House back then. Instead, we used our imagination and whatever we could find to simulate a house, etc. I noticed that I have something in common with both Barbie dolls. When I dressed them up for their photos today, I had a hard time getting their pants and dress zippers zipped! Could it be Barbie is suffering from middle age spread too? Well, isn't this refreshing; a report on the Tea Party movement from someone who attended and gets it! Columnist Patrick McIlheran shares his experiences from the July 4th Taxpayer gatherings in A coalition of normal has a rally. They certainly are not the Possible American extremists according to Homeland Security's Secretary Janet Napolitano. "Tea parties were held in about 21 towns across the state Saturday, follow-ups to the convergence of about 7,000 people on Madison in April. The nonpartisan but conservative Americans for Prosperity, which assisted local organizers, guesstimated they drew 6,000 or so people. If you can draw 6,000 Wisconsinites to hear hours of politics on a day everyone else is grilling brats, you may have a movement. So who were these people?" "They weren't especially grumpy nor graying. Crowds were salted liberally with the first-time voters of 2024 and parents holding them. In Mayville, a 22-year-old spoke to roughly 200 people standing in Foster Park as teenagers actually listened. Youngsters waved signs reading things like, 'Give me liberty, not debt.'" "This, then, is the constituency for an alternative to Obamaism. It's the coalition of normal: People reasonably happy with their lives, families and country. They are not ideological so much as in favor of a government that knows its place and respects theirs." "Which is, when you think about it, a pretty Fourth of July idea." Call Senators! Can voters' ire dampen US Senate's Cap-and-Trade Tax Vote? While evidence mounts that the planet is NOT warming, the US House of Representatives passed the Waxman-Markey Cap-and-Trade (Tax) Bill anyway, by just 5 votes. The Cap-and-Trade Tax bill then went to the US Senate. "Cap-and-trade is very expensive and amounts to nothing more than an energy tax in disguise. After all, when you sweep aside all the complexities of how cap and trade operates--and make no mistake, this is the most convoluted attempt at economic central planning this nation has ever attempted--the bottom line is that cap and trade works by raising the cost of energy high enough so that individuals and businesses are forced to use less of it. Inflicting economic pain is what this is all about. That is how the ever-tightening emissions targets will be met." The Cap-and-Trade Tax bill will hurt energy consumers--that means us. Because the bill includes new taxes on electricity producers (oil, coal, natural gas), oil refiners (gasoline, diesel fuel etc.) and natural gas, virtually no one is immune from the higher energy prices and restrictions that will result. Since many businesses are already struggling just to stay afloat during the recession, I cannot imagine what adding additional energy costs to their bottom lines will do. Many households are also struggling just to pay their mortgages and bills--especially if the head of the household is unemployed. What is the Congress thinking? All of these higher energy producer costs will be passed onto us. "For a household of four, energy costs go up $436 that year, and they eventually reach $1,241 in 2035 and average $829 annually over that span. Electricity costs go up 90 percent by 2035, gasoline by 58 percent, and natural gas by 55 percent by 2035. The cumulative higher energy costs for a family of four by then will be nearly $20,000." That translates to almost $3,000/year average from 2012 - 2035. By the time we hit 2035, the annual cost estimate is over $4,600! With those kind of cost of living increases, will the baby boomers ever be able to retire? Well, there goes the college fund, home improvement project, the family vacation or just being able to live at your present level of income. Our only defense is to CALL our US Senators. (Calls are more effective than emails.) I know we have 2 Senators that are not very responsive to our pleas, but even Gov. Doyle and Sen. Jim Sullivan seemed to be influenced a bit by negative voter outcry. Plus, if you take the time to call, I think you will stay more engaged in the issues. My real hope lies in those US Senators who are facing reelection, but I will do my part with Sen. Kohl and Feingold just the same. I hope you will too.